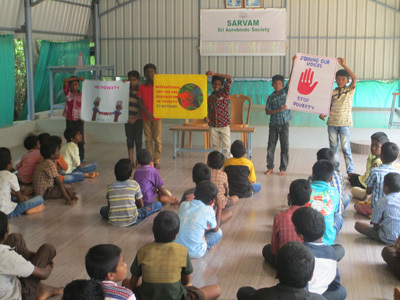 Sri Aurobindo Rural & Village Action & Movement (SARVAM), in association with Shanti Ashram, conducted a programme to commemorate the International Day for the Eradication of Poverty (IDEP), a global event observed every year on October 17. SARVAM organized an awareness programme for 800 students on eradicating poverty on October 19, to commemorate the international event. 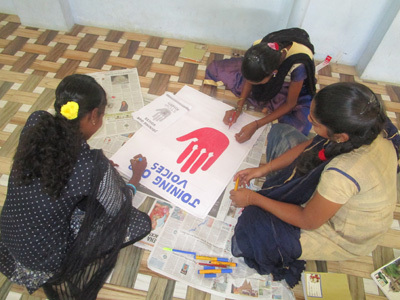 The main objective of this programme is to help students be aware about the different ways in which they can be instrumental in eradicating poverty. Initially the coordinators spoke on the reasons for poverty and how to overcome it. After the short introduction, all the students were asked to ideate and create posters on how they can contribute to eradicate poverty. The creativity of all students came out in their posters, which brought forth many imaginative and innovative thoughts on the topic. In the next session, all the students were asked to give a short speech on how to eradicate poverty. A few select students were given time for preparation and then they were asked to present their views on poverty eradication. Again, the speeches reflected some wonderful ideas, deep thoughts and the passion the students have to root out the scourge of poverty. Finally, all the students took an oath (Uruthi Mozhi) on poverty eradication. The programme was very useful for the students to be aware about this grave social and economic issue. The programme ended with distribution of sweets and snacks to all the participants.